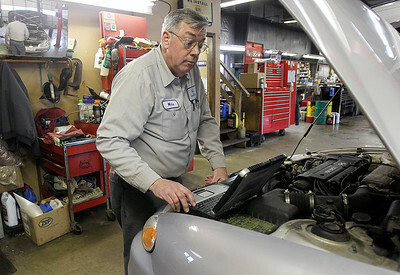 Sarah Nader - snader@shawmedia.com Kevin Fraser works on a car at Mike's Service Center in Crystal Lake on Monday, March 18, 2013. 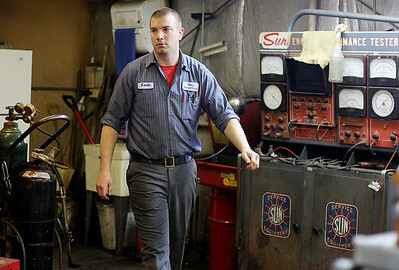 Kevin's dad, Mike opened up the shop 30 years ago. Kevin has been working with his dad for the past 10 years. Sarah Nader - snader@shawmedia.com Mike Fraser, owner of Mike's Service Center in Crystal Lake poses for a portrait in his shop on Monday, March 18, 2013. The company is celebrating 30 years in business. Sarah Nader - snader@shawmedia.com Mike Fraser, owner of Mike's Service Center in Crystal Lake works on a car in his shop on Monday, March 18, 2013. This year the company is celebrating 30 years in business. 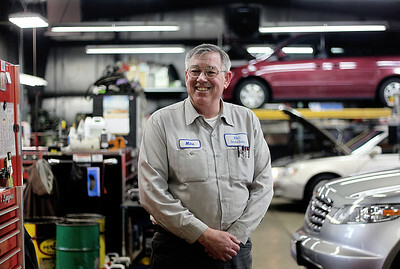 Mike Fraser, owner of Mike's Service Center in Crystal Lake poses for a portrait in his shop on Monday, March 18, 2013. The company is celebrating 30 years in business.